After The Match at Cafe Saffron in Berkeley. There were only a dozen or so of us left, scattered around the cafe, utterly hopeless. Australia was ahead 2-0 with less than 15 minutes left in the game. We were all drowned in the thought that Iran wasn't going to the 1998 World Cup in France. It was over and done. We were finished. 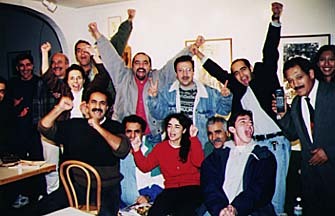 An hour earlier Cafe Saffron in Berkeley was packed with some 200 excited men, women and children hoping to watch Iran's return to the World Cup for the first time in 20 years. Much more than that, they desperately wanted to feel proud again. But most of them soon left when they discovered the game was not being shown on the usual satellite TV channels, and they had to listen to it on a radio with a bad reception. Then someone said a bar in San Francisco was showing the game. Mostafa and I got into my car. I broke speed limits and passed a few red lights to get us to the bar. At 1:30 in the morning there was little traffic and we got there in 15 minutes. We parked and ran towards the bar. There were three customers -- two young women and a man -- and an Irish bartender. "Sorry, lads, I can't get the channel," he said. More Iranians were pouring into the bar pleading with the bartender to do something. He called a few other bars, but they weren't showing it either. There was one bar in Cupertino, but that was an hour away. One of us called Cafe Saffron. "Chand chandan?" he asked. He shook his head and hung up. Australia had scored. Mostafa and I decided to go back to Cafe Saffron. On the way, we talked about all the chances Iran had missed to make it to the World Cup. "If we couldn't beat Qatar, do you think we can beat Australia?" he said in frustration. I kept thinking about Hooshyar Naraghi, the publisher of Sportestan online magazine. I had seen him two days before and asked him if Iran had a chance. "I have no doubts," he said. I thought he meant he was sure we were going to lose. "We are going to win. I'm absolutely certain." We got back to Cafe Saffron. As we were rushing to go inside, a man smoking a cigarette out in the cold told us not to hurry. "ajaleh nakon aqa, ajaleh nakon. do heech aqaban." Inside, no one was even listening to the radio anymore. They were staring at the floor or objects around the cafe. "Bagheri!! GOAL!!! GOAAAAAAL!!!!" the radio reporter shouted. We all came alive. We were jumping up and down. And with Khodadad Azizi's goal four minutes later, we were in heaven. We almost had a few heart attacks in the final minutes when the reporter described Australia's constant, serious, threats on our goal, and Ahmadreza Abedzadeh's heroics. And then the game was finally over. It was as if we'd never ever felt so happy before. Absolute joy. We had come from the depths of despair to the heights of ecstasy. These pictures were taken minutes after the match. Click on the images to see full picture.